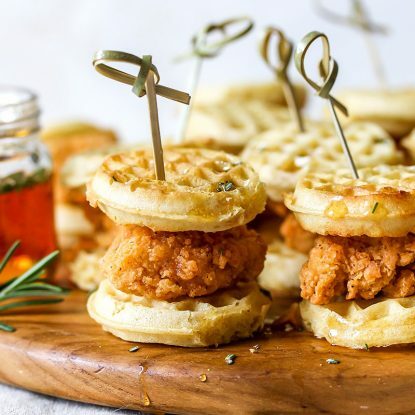 Hungry after eating sweet quick breads for breakfast? 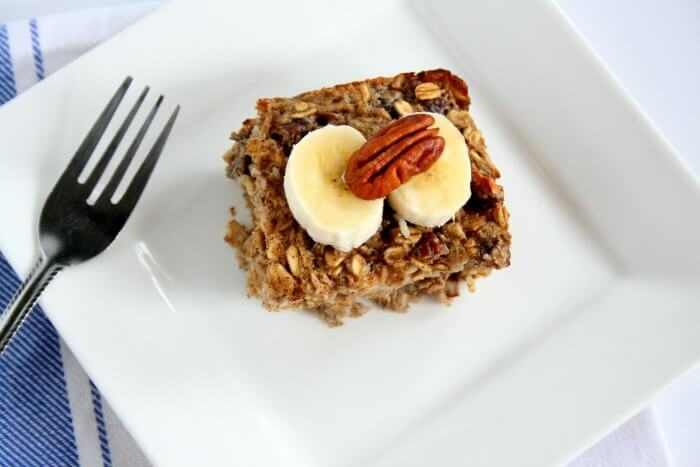 Try my baked banana bread oatmeal. It’s filled with nutritious ingredients that will fuel you through the day! 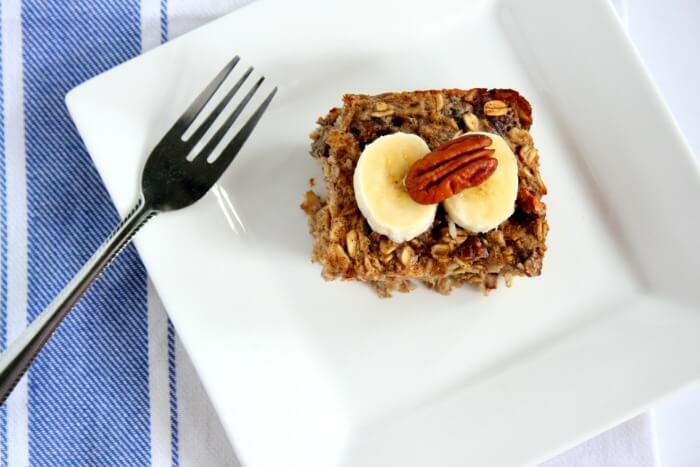 I love making fun twists on traditional recipes so I decided to take my grandmother’s banana bread and give it a heartier and healthier breakfast spin. I love eating sweet quick breads for breakfast but I’m immediately hungry after eating them. They just don’t fill me up. Enter my new recipe: Baked Banana Bread Oatmeal. 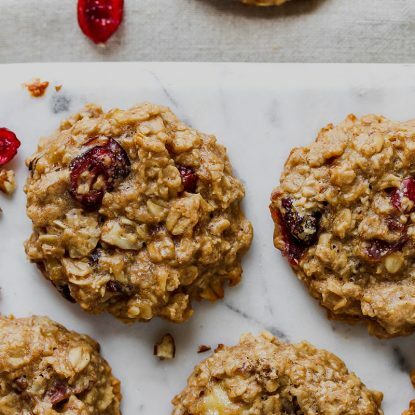 It combines two of my breakfast favorites, warm, comforting banana bread and hearty oatmeal, for a hand-held treat that bakes while I’m getting ready for work. This morning-time dish has what I like to call the power trio of nutrients including fiber (from the nuts and oats), protein (from the milk) and nuts), and fat (from the nuts) to provide “staying power” to keep me full throughout the morning so I won’t be scavenging the pantry or swinging into the convenience store mid-morning for a snack. Because I often eat breakfast on the run (as in, around my house after children), I wanted to make sure that the oatmeal was sturdy enough to be hand-held while still maintaining it’s moist center. This recipe does just that! It can easily be plated and topped with fruit and cinnamon-sprinkled Greek yogurt but it’s also filling and satisfying as a portable bar for breakfast or a snack. In order to maintain freshness, I wrap the baked oatmeal squares (once cooled) individually in plastic wrap and then freeze them in a large zip-top baggie. When I’m ready to eat, I just dig out a square, warm it up, and I’m ready to go. 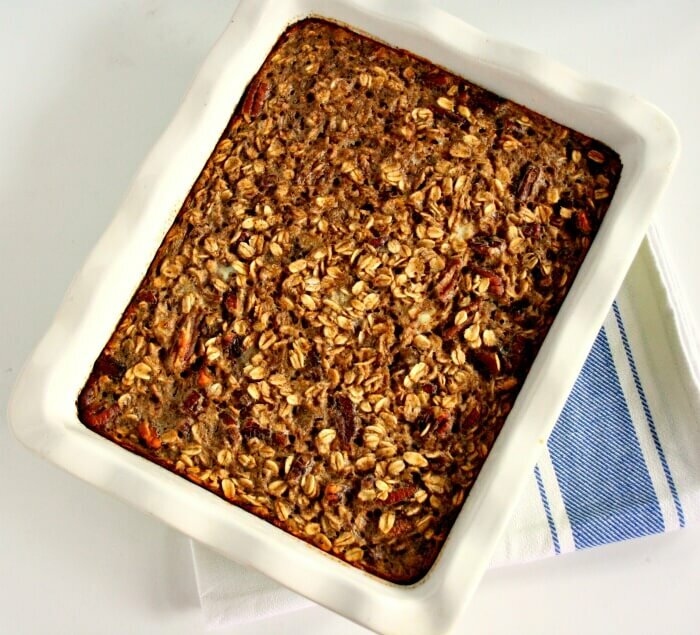 This baked oatmeal is also an easy gluten-free breakfast for those following a gf lifestyle. If you’ve had to pass up banana bread in the past because of the flour, then this baked banana bread oatmeal will certainly fill the void if you use gluten free oats and baking powder. Feel free to use this recipe as a base and then get creative with other ingredients. You can sub out the pecans for pistachios, walnuts, or almonds as well as stir in peanut butter, chocolate or butterscotch chips, apple chunks or blueberries. Do you have a favorite banana bread recipe that was made with love by a grandparent or loved one? 2. Lightly grease an 8″ x 8″ baking pan. In a large mixing bowl, combine the first 6 ingredients and stir. In a separate mixing bowl, mash the bananas. Add the eggs and whisk with banana until frothy. Add the remaining “wet” ingredients and stir. 3. Combine wet ingredients with dry ingredients and stir until combined. Transfer to baking pan. 4. Bake for 35 to 40 minutes or until the center is done. Cool on a wire rack 10 minutes. I love your twist on your grandmother’s banana bread! Thanks so much, Cindy! Her recipe is pretty close to perfection so I figured I needed to make a separate twist! i honestly had baked oatmeal on the brain this week… and this one is perfection. nothing i love more than a pecan-laden, cinnamon-spiked breakfast. Let me know if you try it! The flavor combo possibilities are endless! 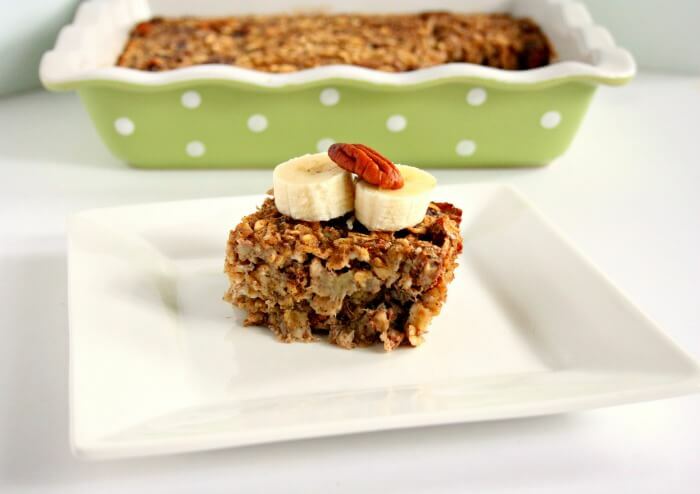 What a smart way to repurpose your grandmother’s banana bread! I love baked oatmeal and I always have leftovers. I had not thought to cut and freeze the individual squares. What a time saver! Thanks so much, Marisa! It has been helpful in the morning to reach in the freezer and reheat 1 square at a time. Plus, it keeps me from eating the whole batch! Thanks, Farrah! Yes, sturdier was key since I sometimes need to pick something up and go. 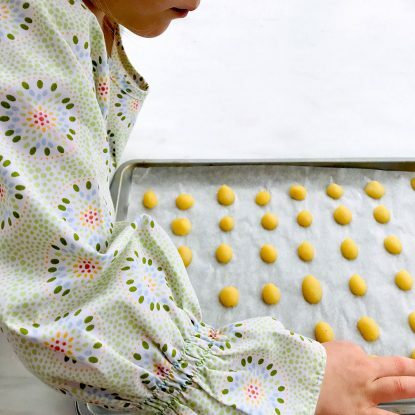 Please pass the recipe along. It is SO easy! I think I could eat this any meal of the day! Love the recipe cards—- special memories for sure! Thanks, Katie! She had some great recipes. Yes! They definitely are an all day treat! you got me at banana bread! This looks awesome! Thanks, Claire! Let me know how you like it! Thank you for this recipe. I am looking forward to trying it. My only concern is all the sugar in it. Do you think the taste would alter much if I excluded the sugar? Or added less? Just trying to keep sugar to a minimum. Thanks! I think you could cut it in half or substitute it for a natural sugar source. The ripe bananas adda sweet flavor. I would like to try it with some craisins or other dried fruit. I only used 1/4 cup brown sugar…trying to minimize my sugar intake. That sounds like a good idea. How did it taste?